GNOME Shell is the graphical shell of the GNOME desktop environment starting with version 3, which was released on April 6, 2011. It provides basic functionality like launching applications, switching between windows and is also a widget engine. GNOME Shell replaced GNOME Panel and some ancillary components in GNOME 2. In contrast to the KDE Plasma Workspaces, a software framework intended to facilitate the creation of multiple graphical shells for different devices, the GNOME Shell is intended to be used on desktop computers with large screens operated via keyboard and mouse, as well as portable computers with smaller screens operated via their keyboard, touchpad or touchscreen. Clutter and Mutter support multi-touch gestures. A single window button by default, Close, instead of three (configurable). Minimization has been removed due to the lack of a panel to minimize to, in favor of workspace window management. Maximization can be accomplished using the afore-mentioned window snapping, or by double-clicking the window title bar. A fallback mode is offered in versions 3.0–3.6 for those without hardware acceleration which offers the GNOME Panel desktop. This mode can also be toggled through the System Settings menu. GNOME 3.8 removed the fallback mode and replaced it with GNOME Shell extensions that offer a more traditional look and feel. The Linux distribution Fedora uses GNOME Shell by default since release 15. Ubuntu doesn't use GNOME Shell by default, but users are able to install it from the Ubuntu repositories since version 11.10. 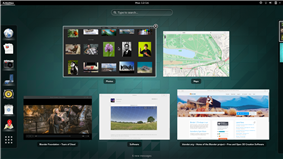 In addition, an Ubuntu Gnome Remix is released alongside Ubuntu 12.10. An official GNOME edition of Ubuntu released by Canonical Ltd. with Ubuntu 13.04 and it was named Ubuntu GNOME. The GNOME version of openSUSE 12.1 uses GNOME Shell by default. Arch Linux dropped support of GNOME 2 in favor of GNOME 3 in its repositories. Mageia will have the current version of GNOME in its version 2. Debian Wheezy (stable) and Sid (unstable) make GNOME 3.4 available. Sabayon Linux uses latest version of GNOME Shell. GNOME Shell has received mixed reviews: It has been criticized for a variety of reasons, mostly related to design decisions and reduced user control over the environment. For example, users in the free software community have raised concerns that the planned tight integration with Mutter will mean that users of GNOME Shell will not be able to switch to an alternative window manager without breaking their desktop. In particular, users might not be able to use Compiz with GNOME Shell while retaining access to the same types of features that older versions of GNOME allowed. The first concepts for GNOME Shell were created during GNOME’s User Experience Hackfest 2008 in Boston. 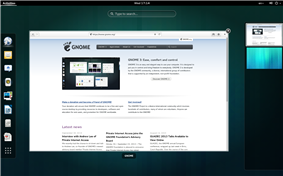 After criticism of the traditional GNOME desktop and accusations of stagnation and lacking vision, the resulting discussion lead to the announcement of GNOME 3.0 in April 2009. Since then Red Hat is the main driver of GNOME Shell’s development. Pre-release versions of GNOME Shell were first made available in August 2009 and became regular, non-default part of GNOME in version 2.28 in September 2009. It was finally shipped as GNOME’s default user interface on 6 April 2011. ^ "GNOME 3.14.2 is out". GNOME mailing list. November 13, 2014. Retrieved November 13, 2014. ^ Clasen, Matthias (October 30, 2014). "GNOME 3.15.1". gnome-devel-announce mailing list. https://mail.gnome.org/archives/gnome-announce-list/2014-October/msg00042.html. Retrieved November 11, 2014. ^ "GNOME UX Design Team". Retrieved 2014-11-13. ^ "GNOME Shell Design". Retrieved 2014-05-21. ^ "GNOME 3.7: what is happening now | Goings on". Blogs.gnome.org. 2012-12-05. Retrieved 2013-03-12. ^ Andrew (2012-10-19). "Prefer GNOME Shell? Download Ubuntu GNOME Remix 12.10 ~ Web Upd8: Ubuntu / Linux blog". Webupd8.org. Retrieved 2013-03-12. ^ "Introduction to Ubuntu GNOME". ^ Matt Hartley, Chris Fisher (5 January 2014). "In Defense of Gnome 3". ^ "My glimpse at Gnome-Shell". Mad for Ubuntu. Archived from the original on 2010-05-23. ^ "Boston2008/GUIHackfest - GNOME Live!". Live.gnome.org. 2008-10-14. Retrieved 2013-03-12. ^ "Timeline: The Greatest Show on Earth". Be the signal. 2011-03-15. Retrieved 2013-03-12. ^ "gnome in the age of decadence". wingolog. 2008-06-07. Retrieved 2013-03-12. ^ "Planning for GNOME 3.0". Mail.gnome.org. 2009-04-02. Retrieved 2013-03-12. ^ Matthew Garrett (mjg59) wrote, 2010-10-26 18:39:00 (2010-10-26). "mjg59: Fun facts". Mjg59.livejournal.com. Retrieved 2013-03-12. ^ "ftp.gnome.org". Ftp.acc.umu.se. Retrieved 2013-03-12. ^ "GNOME 2.28 Release Notes". Library.gnome.org. Retrieved 2013-03-12. ^ "TwoPointNinetyone - GNOME Live!". Live.gnome.org. 2011-03-24. Retrieved 2013-03-12. ^ "GNOME 3.0 with GNOME Shell officially launched | ITProPortal.com". Thinq.co.uk. Retrieved 2013-03-12.